Congrats to Garage Racers on new additions to their families! Chad Marion (Colin, 6/18, 7lb 8 oz), Mike Murdin (Axelle, 7/26, 8 lb 3 oz), Jason Bethel (Sarah, 6/22, 7 lb 14oz), and Kyle Farrell (Sawyer, 7/13, 8 lb 1 oz). Colin is obviously the climber of the new arrivals, though his dad will likely teach him a wicked sprint. 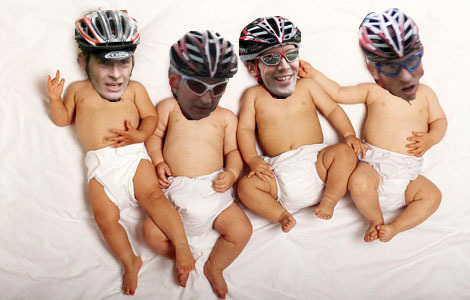 Something about diaper changes (or prep for) have given a bunch of 5th place finishes for the new dads. Chad took 5th at the Ballard Crit just prior to Colin's arrival. Jason Bethel celebrated Sarah's arrival with 5th at Redmond Derby Days. Mike took 5th at the Brad Lewis/Boat Street Crit. Kyle had 5th at the Skagit Flats circuit race.